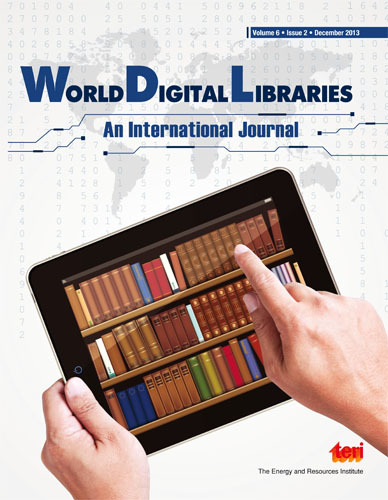 World Digital Libraries is an international peer-reviewed biannual journal. The journal seeks quality research papers that present original theoretical approaches. It also seeks experimental case studies related to digital library developments, maintenance and dissemination of digital information focusing on research and integration of knowledge at the interface of resources and development. The journal will, therefore, keep readers abreast with the current developments and contain articles, reviews, current developments, and case studies, encompassing the following areas. Theoretical and methodological issues that relate to the interrelationships among electronic resources management, digital preservation, multiple access, multilinguality, copyright issues, and security aspects. The article focuses on the initiatives of Government of Gujarat (GoG) to publish categories of publications through the websites of various departments and other entities on open access domain since February 2000. The GoG has been trying to improve the quality of its websites and policies of information management. However, it is essential to bring all the documents published by GoG which are available on open access domain at one place to provide better access in vernacular language to its large number of users or citizens. The article discusses the current practice of GoG to manage the documents, such as government resolutions, notifications, and circulars through websites, the searching and retrieval mechanism, language of user interface, online visitors to the various websites, etc. Further, the article discusses the mechanism to create a digital library through Greenstone Digital Library Software (GSDL) in vernacular language. It also presents the One-Stop-Search model which enables the users to search the documents through Gujarati (vernacular) language interface. The transformation of research to e-research emphasizes on the value of research data. Development of re3data.org, a unique registry for research data preservation across countries, is a great opportunity for researchers. This registry has been using a tool to identify the most effective repository resources for desired research. The primary objective of this article is to explore research data understanding in the Indian research community and the auxiliary objective is to depict an overview for present development of research data preservation in Indian repositories. Technological developments imply a genuine transformation of the entire landscape of modern-day society. Information is power and its preservation and dissemination is a treasure for generations to come. The digital content, available today, is throwing serious challenges among the information industry to preserve and provide secured access; Open Access Digital Library Software, such as DSpace, E-prints, and Greenstone, etc., is capable of meeting such challenges. The library and information science (LIS) professionals have been imparted various training platforms to learn pedagogy of such software. DSpace is one of the most prominent and globally used institutional repository software. This article presents an effort to understand the impact of DSpace training programmes/workshops on LIS professionals. The study has been conducted with a purpose to make an assessment of the usage of a selected set of e-book collections with an objective to work out the similarity or difference in their use across selected states of northern India. An effort has also been made to see whether the users use a single or a combination of e-book collections. Seven sampled universities were surveyed personally by the investigator for collecting data about the questions under investigation. A questionnaire was used as a data collection tool. The investigator also availed of the telephonic and e-mail communication and had a face-to-face interaction with respondents to collect prompt responses, substantiate the responses, and remove ambiguities thereof. Statistical Package for Social Science (SPSS) was analyze the data on an empirical basis. Chi Squared (Ï‡2) Test has been used to derive association between the variables and test the level of significance. It has been found that only one e-book collection, the â€˜CAB e-Booksâ€™ is being subscribed and that too by only 42% of the libraries. Thus, the e-book collections has not yet gained popularity among the users of north Indian agricultural libraries, as this e-book collection is found to be used only by 58.33% of users. However, the libraries where the e-books are being subscribed regularly register a comparatively high usage than the ones where it is not as it is found that majority (77.30%) of users therein use e-books on a â€˜dailyâ€™ basis. Krishikosh, the recently initiated e-book platform in India is fast gaining its popularity. It is also statistically verified that there is a significant association between â€˜use of e-book collectionsâ€™ and the â€˜Stateâ€™ & â€˜Universityâ€™ as two variables; that is, the usage of the e-book collections under study varies quite significantly from state to state and from university to university (p<0.01). This article studies certain bibliometric facets of World Digital Libraries – an International Journal, a journal published by TERI. First published in 2008, now in its eleventh year, the journal examines bibliometric parameters, such as research output, authorship, collaborative measures, networking, authors’ and institutions’ productivity, contribution from foreign countries, and geographical distribution. So far, the journal has published 110 papers, contributed by 204 authors from 105 different institutions. The study found that the research output in 10 years has decreased by 0.95 per cent. However, on an annual account, some years registered a positive growth. Single authorship (52 papers) was seen as more prevalent in the authorship pattern. Among joint-author papers, two-author (29 papers) and three-author (24 papers) papers are more common. The least is five-author paper (1 paper). Single authorship remained constant while joint authorship decreased by 1.81 per cent. Overall, collaborative measures for the decade, namely, degree of collaboration, collaborative index, and collaboration coefficient was found to be 0.53, 1.89, and 0.31, respectively. Margam Madhusudhan was found to be the top contributor (6.5 papers); while University of Delhi, India, as the most productive institution (11.5 papers). Among the foreign authors, Heather Brown of the University of South Australia is the top contributor. Amongst the foreign institutions, University of Malaya, Malaysia and University of South Australia (3 papers each) contributed the most. Out of the 110 papers, 49 papers are contributed by 23 foreign-based institutions, in the true spirit internationality. Online version is free along with the Print version. Professor Michael Seadle, Director, Berlin School of Library and Information Science, HEADT Centre (a research project); Executive Director, iSchools, Inc.
World Digital Libraries is an international peer-reviewed biannual journal. The journal seeks quality research papers that present original theoretical approaches. It also seeks experimental case studies related to digital library developments, maintenance, and dissemination of digital information focusing on research and integration of knowledge at the interface of resources and development. The journal will, therefore, keep readers abreast with the current developments and contain articles, reviews, current developments, and case studies, encompassing the following areas. Articles should examine concepts, analyses, and case studies of important issues in the field. Book reviews should be of recent publications in the field, to be reviewed by an independent reviewer. Commentaries should discuss critical issues in the field. Authors are requested to send a soft copy (in Microsoft Word format) of their contribution to the editor, either in a CD or as an e-mail attachment. All submissions will be peer-reviewed using the criteria of originality, accuracy, and quality of contribution in these fields. Articles must be original, in English, and should not exceed 8,000 words. The main text should be double-spaced with headings and sub-headings clearly indicated in the text. All tables, figures, and equations should be numbered in Arabic numerals and clearly cited in the text. All measurements should be in metric (SI) units. The manuscript should be arranged in the order given below. The following shorter items are also welcome and must be typed in the same way as major articles. In the text, the surname of the author(s) followed by the year of publication of the reference should be given, for example, (Hall 1993). In case of several publications by the one author or by a group of author(s) in one year, use notations ‘1993a’, ‘1993b’, and so on. Up to three authors can be mentioned in text references; more than three authors should be limited to the first three authors’ names followed by ‘et al.’ References must be listed alphabetically at the end of the paper (double spaced) and should conform to the following style. Carmichael J B and Strzepek K M. 1987; Industrial Water Use and Treatment Practices; London: Cassell Tycooly. 291 pp. Sintak Y. 1992; Models and projections of energy use in the Soviet Union; In International Energy Economics, pp. 1–53 edited by T Steiner; London: Chapman and Hall. 350 pp. Authors are requested to use as few footnotes as possible, and keep their length to the minimum. Footnotes should be indicated in the text by superior Arabic numerals, which run consecutively through the paper. They should be grouped in order of appearance at the bottom of the concerned page in numerical order and must be double-spaced. On acceptance, contributors are requested to provide the editor the final version of the article in soft and hard copy. Please observe the following instructions. Tables, figures, illustrations, should be on separate sheets. Retain a backup disc for reference and safety. One set of proofs will be sent to the author before publication, which should be returned promptly within 48 hours of receipt. Authors are urged to check the proofs carefully as late corrections cannot be accepted. Apart from one free copy of the journal to the authors, 10 free offprints will be supplied to the first author. Further offprints and copies of the journal can be purchased at a reasonable cost, if ordered when sending the final copy of the article, or when returning the proofs. The responsibility for the contents of the paper rests with the authors, not with the editor or the publisher. Contributions are accepted for refereeing on the understanding that they have been submitted only to this journal and not to any other journal. Only when each author signs and submits the CTA (Copyright Transfer Agreement) can TERI Press publish the article. This CTA enables TERI Press to protect the copyright material for the authors, but does not affect the authors’ proprietary rights. The CTA covers the exclusive rights to reproduce and distribute the articles, including reprints, photographic reproductions, or any other reproductions of similar nature and translations, and includes the right to adapt the article for use in conjunction with computer systems and programmes, including reproduction or publication in machine-readable form and incorporation into retrieval systems. Authors are responsible for obtaining, from the copyright holder, permission to reproduce any figures for which copyright exists.